The British Shorthair is a compact, well-balanced and powerful cat. Females should be less massive than males in all respects, and the cat should leave an overall impression of balance and proportion. The head of the British Shorthair is round and massive, well-set on a thick neck. The forehead should not slope. The muzzle is distinctive and well-defined, with definite jowls in males. Ear set is very important - they should be set far apart and fit into the rounded contours of the head without distorting. Eyes should be large, round, and well opened. 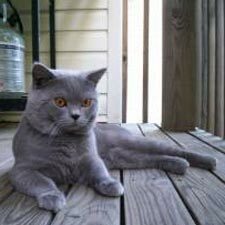 The body of the British Shorthair should be well knit and powerful; the breed has a history as a strong working cat and this should be reflected. Legs are short to medium in length, well-boned and strong with firm, round paws. The coat comes in 36 colors and patterns and should be short and dense, similar to running your hand through thick, warm velvet. The British Shorthair is a calm cat, always seeming to be in quiet control of the people and surroundings in his or her environment. 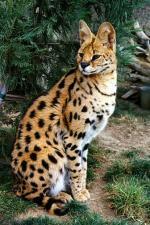 They are a large cat, preferring to stay low to the ground and not prone to acrobatics or mad tearing through the house. Steadfast family companions, they are ideal for a busy household. They appreciate the time given to them without demanding your full attention. They love children and children love having their own 'Cheshire Cat'. British Shorthairs get along well with all other animals as long as their needs are met and are a playful and alert breed that avoids hyperactivity. Both easy to care for and very strong, the British Shorthair has few health problems thanks to its diverse gene pool. 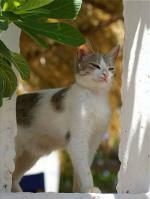 They have a short, easy to groom coat and require only occasional brushing. The British Shorthair is the oldest of the English cats with a history that traces back to the Roman occupation. It was a breed first prized for its abilities as a working cat, and only later for its calm manner, loyalty, and endurance. 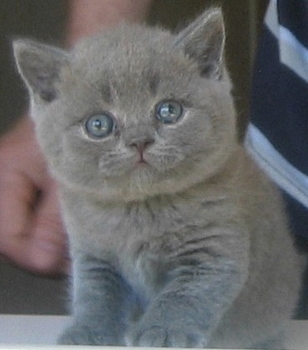 The first attempts to breed the British Shorthair for color, type, and pedigree were not started until the 1800's. Originally known by most as the British Blue due to the coat color, they came to include all ten original color classes under the single moniker of British Shorthair in the 1950's. The type standard, however, has remained the same. 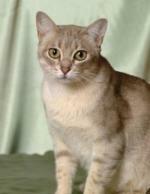 In early cat shows, the British Shorthair was very successful. 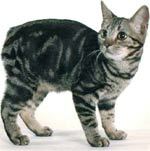 World War I saw a decrease not only in the attention to professional cat shows, but also in the number of breeding pairs. As interest in the world of cat fancy grew following the conclusion of the war, it became a challenge for breeders to meet demand. This led to the breeding of pedigreed cats to unregistered domestic shorthairs. Sadly, this brought a loss of type and for three generations the British Shorthair suffered in the show ring. Very few British Shorthairs survived World War II and those that remained were too closely related to form a strong gene pool. 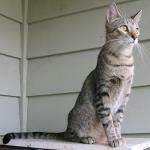 In order to provide the breed greater genetic diversity, breeders began to outcross to un-pedigreed cats once again, as well as Russian Blues, Burmese, and Chartreux. The resulting cats were foreign looking and lacked the distinctive features of the British Shorthair, such as the round face and dense coat. This forced breeders to add Persian to the mix. It was a long road, the foreign look often lurked in the background causing breeders to add Persian again and again while trying to avoid the Persian trademarks of snubbed nose and long coat. Though the breed has been in the United States since the 1900's, it has grown slowly in popularity. They are comparatively rare and did not receive Championship status with the CFA until the 1980's. They are, however, gaining in popularity as animal trainers find their calm attitude and pleasant demeanor ideal for film and television.